Welcome to Massachusetts Together We Can. We are a grassroots organization of people who have come together because of the increasing threat to our civil liberties, to human rights, guaranteed in our Constitution. We share the belief that each of us has an active role in preserving democracy. Through our votes and our voices, we are the critical check in the balance of power. As activists, we engage in peaceful protest and outreach to local, state, and federal elected representatives. At the same time, we participate in political campaigns in Massachusetts and around the country, supporting candidates who share our belief in equality and justice for all people. Join us in meeting with political leaders to advocate for our shared goals. Include your voice in phone calls to members of Congress to protest or support a range of initiatives. Be part of phone banks on behalf of Democratic candidates in Massachusetts and across the country. Rally with us to support civil rights; affordable and accessible health care; good public education; economic opportunity; environmental protection; and protection from predatory financial institutions. We are what democracy looks like! We work to preserve the rights we hold dear. Massachusetts, Together We Can! JOIN our email list to stay current with ways you can help. 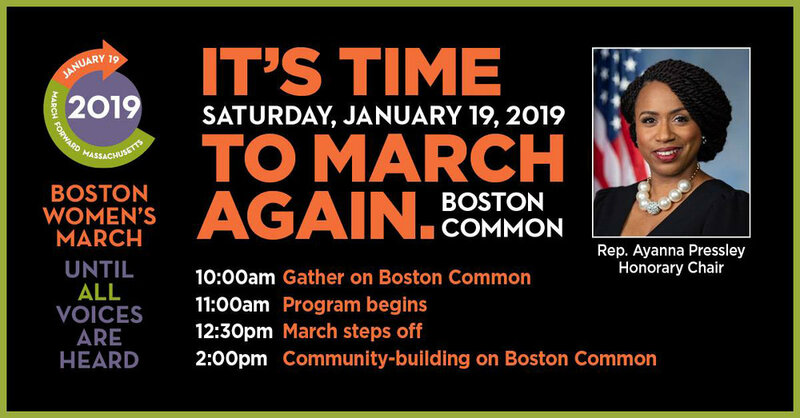 Join us on Saturday, January 19, 2019 for the Boston Women’s March.